While current leadership contenders sing from a similar right-wing hymn sheet, a Labour Party under Jeremy Corbyn would be rooted in the community and committed to social change, the veteran left-winger claimed as he announced his candidacy. The 66-year-old MP told the Islington Tribune on Wednesday night he was standing “in response to an overwhelming call by Labour Party members who want to see a broader range of candidates and a thorough debate about the future of the party. Corbyn, who increased his majority as MP for Islington North by 5.8 percent in May’s general election, is a veteran campaigner and a central figure in the dwindling left of the Labour Party. His views on foreign policy are perhaps best expressed by his activism, which includes support for the Palestinian cause and vocal opposition to the former Apartheid regime in South Africa before its fall in 1994. 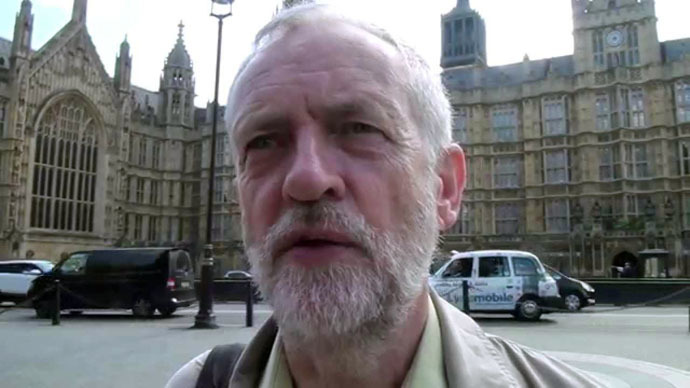 Corbyn is also a long-time supporter of the Campaign for Nuclear Disarmament (CND) and the Stop the War Coalition. He has also been one of Labour’s most rebellious MPs, defying the party whip 238 times. His announcement comes in the wake of Labour’s general election defeat and virtual wipeout in its traditional strongholds in Scotland, a crisis which has forced a debate on how to reorganize. Some wish to see a move back towards the “aspirational” rhetoric and adventurist foreign policy of Blairism, while others to the left prefer a return to administering the needs of Labour’s traditional working class base. While Corbyn’s politics fit more closely with the latter category, his rivals’ politics are arguably more in line with the ideals of Tony Blair’s New Labour. Those who have already declared their intentions to stand for leadership are current frontrunner Andy Burnham, Shadow Development Secretary Mary Creagh, Shadow Home Secretary Yvette Cooper and Shadow Health Minister Liz Kendall. Corbyn claims his rivals are much too alike to facilitate a broad debate. “They are not offering a clear enough alternative on the economic strategy and austerity, and our attitude to welfare expenditure,” he said. Given the right-wing’s dominance among Labour MPs, questions remain about whether Corbyn can gain the 35 nominations from other MPs needed for him to stand.